Retail treasury bonds or RTB is another type of investments we can venture here in the Philippines. This type of investment is “virtually” risk-free. It is considered zero-risk because it is a direct, unconditional and general obligation of the Republic of the Philippines. The yield is assured if the investor holds on to the bond until maturity, otherwise it will be subject to interest rate risk depending on the prevailing market rate at the time the RTBs are sold in the secondary market. 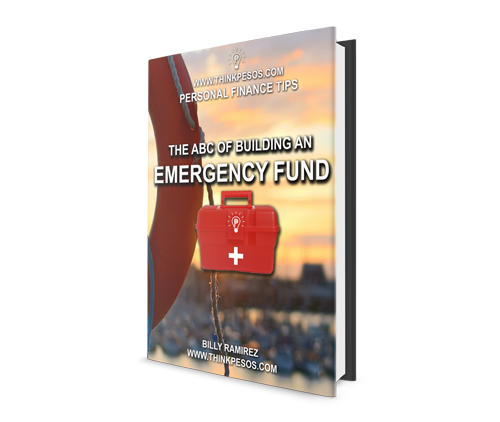 In this short article, I will share basic and fundamental information about retail treasury bonds. Here we go. What is Retail Treasury Bonds (“RTBs”)? The Retail Treasury Bonds (“RTBs“) form part of the National Government’s program to make government securities available to retail and individual investors. During the Public Offering Period, RTBs will be made available by the Bureau of the Treasury (“BTr“) through the Selling Agents to the following: Individuals, Corporations, Financial Institutions and other Institutional Investors. zero-risk. They are direct, unconditional and general obligations of the Republic of the Philippines (“ROP“). higher-yielding. Interest rate is superior to other investments. They are available for as low as P5,000 investment (during the Public Offering). Pay frequent cash flows. Interest payments will be made quarterly. Liquid. They can easily be bought and sold in the secondary market through the Selling Agents subject to minimum requirements and market rates. Who can purchase the retail treasury bonds or RTBs? The RTBs aim to cater to retail investors such as individuals and corporations who are looking for a zero-risk, accessible and higher-yielding investment alternative for their savings. The minimum denomination is only P5,000 and in multiples of P5,000 thereafter. When and where can an investor purchase retail treasury bonds? The RTBs will be sold to the public during the Offer Period which is scheduled by the Bureau of Treasury. There will be designated period given to the public to subscribe to the RTBs through the Selling Agents. Since only a limited amount of RTBs will be issued, the BTr has the option to shorten the Offer Period. The terms and conditions applicable to the RTBs as well as copies of the complete documentation will be made available by each of the Selling Agents during the Public Offering (PO). After the Offer Period investors may still purchase the RTBs in the secondary market at prevailing market rates. 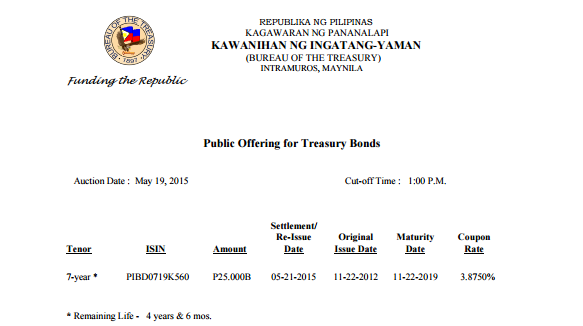 Here’s the latest public offering of treasury bonds taken from treasury.gov.ph. How does an investor participate in the Public Offering? Investors may purchase the retail treasury bonds or RTBs over the counter from the Selling Agents, subject to the documentary and minimum investment requirements of each Selling Agent. Payment procedures for investments in RTBs may vary per Selling Agent. Investors will be required to open a peso deposit account or designate an existing peso account where interest and principal payments of the RTBs will be credited. 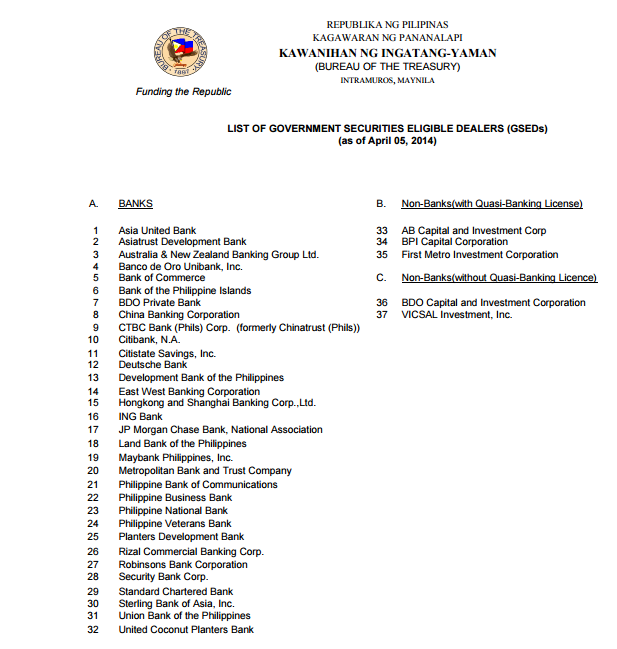 Here is the list of government eligible dealers (GSEDs) as of April 5, 2014. Please take note that the list of GSEDs above do not always participate or may not participate in auction during the public offering. For latest and updated information, please visit the official website of treasury.gov.ph here. All these information are also taken from treasury.gov.ph official website. Investing in retail treasury bonds is one good option for people who do not want risks and volatility. Since the government is the last entity that can be into bankcruptcy, retail treasury bonds provides virtually zero-risks for investors. If investing in the stock market is not for you due to high volatility and risks, investing in treasury bills and investing in retail treasury bonds is another good option. If you’re a conservative type of investor who is looking for an investment that can give you higher returns than a normal savings account or time deposits, investing in retail treasury bonds might be for you. where can we avail of the 5k minimum? we checked with banks and minimum is 100k. Hi Geri, thanks for visiting the blog. No offer/update so far. The last update we got is from Treasury.gov.ph official website and that’s last 2013. You may check here. I’ll update this article once new offer was published. Thanks! good day sir. for how many months or years will I be able to withdraw my assumed investment with an increase? Timeline is already given and the interest rates are fixed. So basically you can only withdraw your money on the maturity date with the interest provided. Thanks! good morning! if we’re able to avail rtb, what about the frequency of deposit? thank you. sir may i ask if magkano rates ngayon? interested ako mginvest. ung namana ko sa erpats ko ilalagay ko nalang sa gov bonds kasi me trabaho pa naman ako. Good day,Can you piease update me when there’s an offer to sell treasury bonds on my email add.thanks. Thanks a lot for posting this blog. It helps a lot for us beginners and planning to invest. Please update me when there is available RTB’s on my email address provided. Pki update po ako dto sa email add ko kpag may available na offer sa RTB’s. What does “minimum investment of PHP 5,000 and in multiples of PHP 5,000 thereafter” mean? 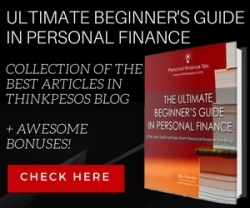 …and can I add the interests that I have earned to the PHP5,000 as investment?